Lloyd Rees valued drawing highly and it was an integral part of his oeuvre. Indeed, through the 1930s it was almost his exclusive focus. 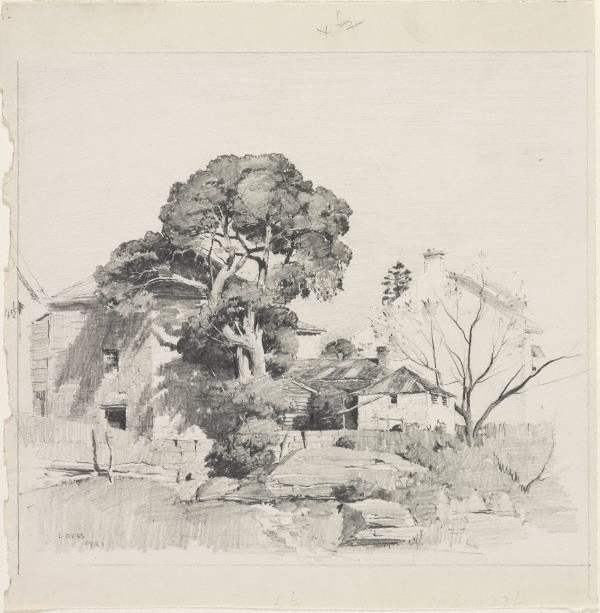 In 1931 he moved to McMahon's Point, on the north shore of the harbour, where he made many drawings of views towards Circular Quay, Balmain, Goat Island and Ball's Head. "The full measure of my highly detailed drawings of Sydney Harbour were done at McMahon's Point. It was drawing purely for the sake of drawing, for by now, I was well out of the swim of the art world ... Drawing was simply an obsession and I was completely absorbed in the discovery of form and composition. The drawings were by no means naturalistic in the sense of simply selecting a subject and drawing it, for there were things brought in and things left out. They were highly worked and I had an intense interest in the manipulation of them. I drew in the morning and then took the work home and looked at it in the afternoon and if I saw anything superfluous, I rubbed it out." Signed and dated l.l., pencil "L REES/ 1931".